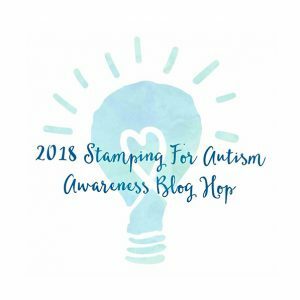 Welcome to my stop on the Autism Awareness Hop for 2018!!! I’m honored to be a participant – and a prize-provider (classes!) – and most of all, happy to be a part of a wonderful, giving community of crafters! 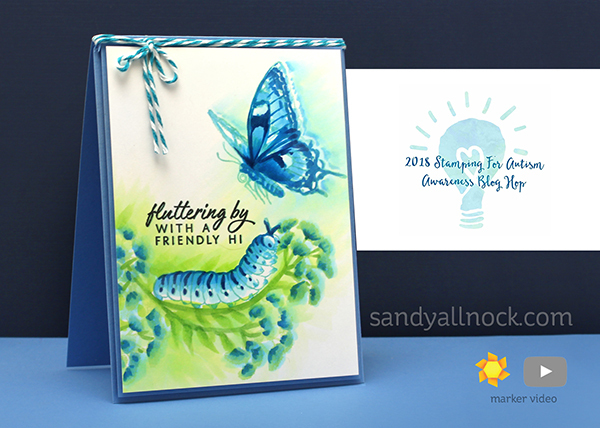 For my card, I’ve created a sweet little caterpillar and butterfly (2 stamp sets from Hero Arts)…they’re color layering stamps, I just picked the ones I wanted to use to create my little scene with Copics. Watch the video below or click HERE to see it in HD on YouTube. Sweet, eh? Sorry it was so fast – I’ve been swamped recently with getting ready for Easter, and tried to limit my time on a bunch of things. Plus, I figured I wanted you to go get busy hopping along! Links are all below to go see more. This is one huge hop…and since lots of folks may be popping over here, I’m going to do a special giveaway to The Art of Autism – isn’t that perfect for our creative proceeds to benefit autism AND the arts! For every comment left here on this blog post within one week, I’ll donate $1 to The Art of Autism. And I encourage each person to also go give to any of the Autism charities, and educate yourself about how YOU can help! This is such a fantastic card design ! Sandy, such a beautiful card! You are an amazing artist! Love this sweet scene for such a worthy cause. 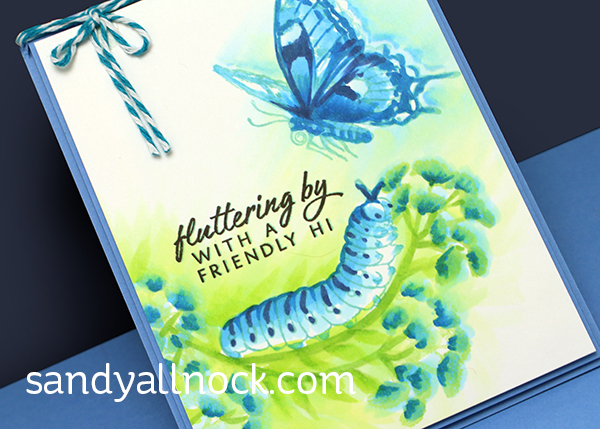 A gorgeous card with the butterfly and the catapillar in those blue colours. And I take my hat off for you Sandy for donating also for the Autism awareness course. Such a beautiful card. Love the concept and the colours are gorgeous! Thanks for the video too. Wow…your coloring always has me in awe!! I LOVE this card and your video. And I am now just wanting some more Copic colors (and these stamps) Lol!! You are amazing. SQUEAL!! Such a BEAUTIFUL Card and Design!! THANKS for sharing the Video and for the chances to WIN!! Have a FABULOUS WEEKEND!! What a special card! Love it and the cause you made it for! Amazing coloring! Love that you included both the caterpillar and the butterfly, what a wonderful look at life, hope, future! Such a pretty card! Love the colors and the layout. What a lovely card – a perfect theme for bring more awareness to the challenges of Autism. I love how you manage to create watercolor looks with Copics – it’s really beautiful! Thanks for sponsoring the hop and cause today, Sandy! I wondered who made the caterpillar butterfly card. Just love the color combination. Autism awareness and treatment is a great cause. God bless! luv this design, Sandy! thanks for being a sponsor on the hop!